MyPhone drops its later flagship smartphone called the Agua Vortex. It may sound unusual but this rebranded Micromax Canvas 4 A210 is one of the top-tier smartphones around. 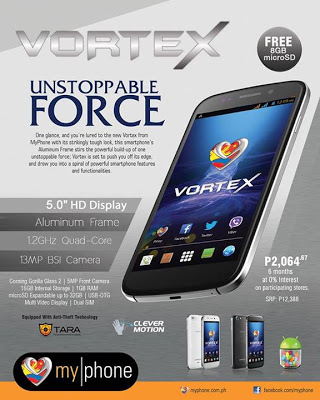 The local company retails the Agua Vortex at Php 12,388. For the specs-nosy, this latest 5-incher is powered by a 1.2GHz quad-core processor, 1GB of RAM, 13-megapixel camera and a hefty 16GB of internal storage. This is designed with an aluminum frame to make it more premium looking than any other local handsets around. The rear camera is also pegged to have a Sony Sensor with LED flash and BSI sensor. However, the front shooter only settles for a capable 5-megapixel for video calls and selfies. Android 4.2 will power this puppy right off the bat. Hardware aside, this phone features Clever Motion that allows you to scroll around the phone when you wave your hands above the screen. It also has the Theft Apprehension and Asset Recovery app to provide added security features to the phone. Availability of this phone is not yet disclosed.